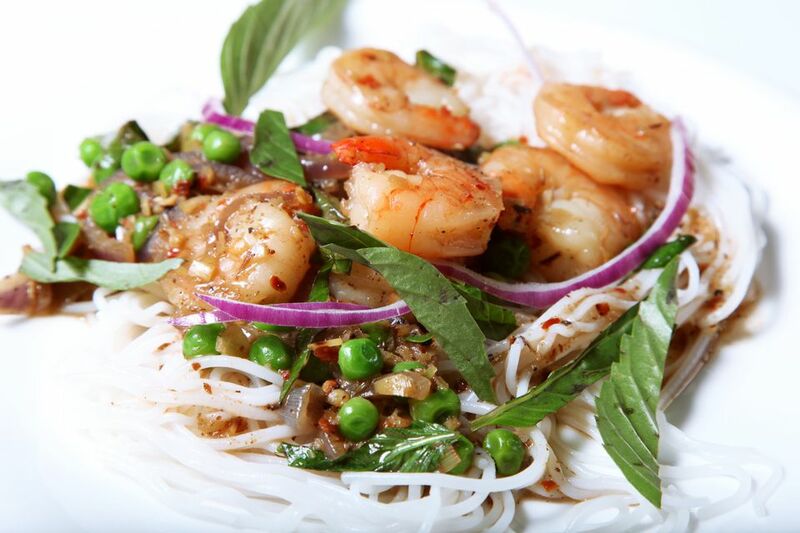 These Thai Coconut Noodles are aromatic and flavorful, plus they're quick and easy to prepare! Make them with shrimp or strips of chicken, or substitute with other seafood such as scallops, squid, or slices of filleted fish. Rice noodles are normally used for this recipe, but wheat or egg noodles are also delicious. The key to this dish is having good-quality coconut milk and great-tasting chicken stock. Also, be sure not to overcook the rice noodles; you want them as close to 'al dente' as possible. Note that this dish is naturally gluten-free - be sure to use wheat-free stock. ENJOY! When rice noodles have softened but are still firm and a little under-cooked in the middle, drain and rinse thoroughly with cold water. Set aside. Place stock in a wok or deep frying pan over high heat and bring to a boil. Tip: If making stock from cubes, taste-test it for flavor (you want it to taste like a good soup base). Now add the shallot or onion, garlic, galangal or ginger, ground coriander, chili powder, chili, and kaffir lime leaf or bay leaf. Boil 1 to 2 minutes. Add shrimp or chicken. Reduce heat to medium, simmering and turning the shrimp or chicken pieces until cooked (3 to 4 minutes). Reduce heat to a gentle simmer (medium-low). Add the fish sauce, lime juice, brown sugar, and 1/2 can coconut milk, stirring well to incorporate. Finally, add the softened noodles. Use 2 utensils to gently turn them in the sauce for 2 to 4 minutes, or until noodles have absorbed most of the sauce and are hot. Remove from heat and taste-test. If noodles are not flavorful or salty enough, add more fish sauce. If too salty or sweet, add more lime juice. Add more chili for more heat. If too spicy, add more coconut milk. Portion up into bowls. Drizzle a little more coconut milk over each portion, and top with green onion and fresh basil. For an additional topping, see below. ENJOY! For additional coconut flavor, place 2 to 3 tablespoons dry shredded coconut (unsweetened or sweetened according to your preference) in a dry frying pan over medium-high heat. Stir continually until coconut turns light golden brown and fragrant, then sprinkle over your noodles.